Oh, as I was coloring this strip I had a synchronicity in which I suddenly discovered Dialogue Free Comics Day! I say synchronicity because my dialogue free comics are pretty infrequent and somehow I just happened to be making this one on the day (or day before?) the event, so, cool! You can see more dialogue free comics on the event site. You'll definitely recognize someone else in this week's alternate ending (now on Patreon), and he's not impressed! 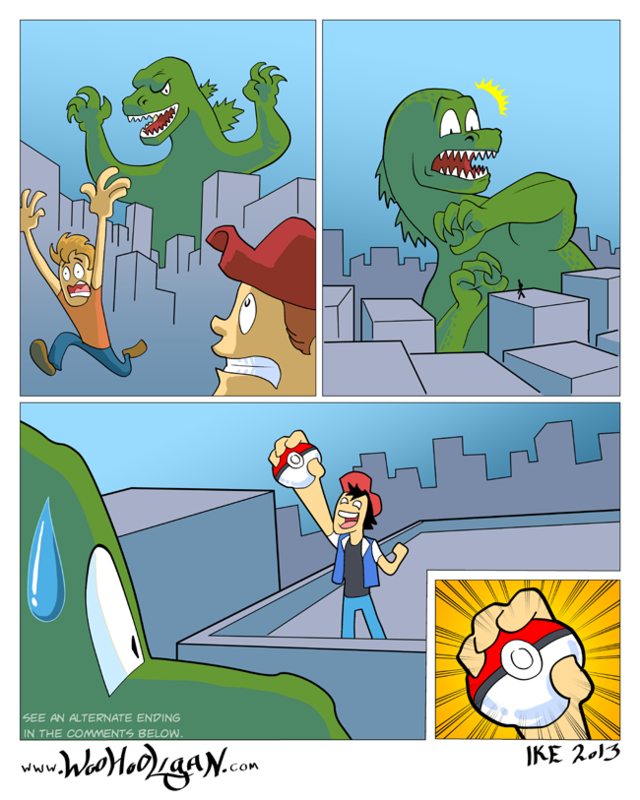 What else could Godzilla possibly fear? You know what else is scary? The Woohooligan Facebook Page. You should definitely like it 'cause, y'know, keep your friends close and your enemies closer. Also I share some jokes on the Twitters. existence of harems in pokeballs - look for pokegirls some stories are inappropriate for youths and children but the general idea is that some crazy scientist wiped out most life on earth and replaced it with generally humanoid anthropomorphic girls who are kept in pokeballs.